Kendall Kia Nampa is proud to bring you the brand new 2018 Kia Rio! This fashionable compact sedan is comfortable, impressive, and has a luxury car feel to its refined interior. With a wide variety of engine choices, trim levels, and features, finding the perfect combination is only part of the fun of the 2018 Rio. This sleek compact sedan comes with a 1.6L four-cylinder engine with options for 6-speed manual transmission or 6-speed automatic transmission with Sportmatic and front-wheel drive. Available in LX, EX, and S configurations, the new Kia Rio in Nampa is head-turning at any trim level. Begin by browsing our available 2018 inventory, then stop by our Kendall showroom and take the Rio out for a test drive. Our dealership is conveniently located at 15700 Idaho Center Blvd. Nampa, ID 83687. We are only a short drive away from the areas of Boise, Meridian, and Caldwell. The 2018 Kia Rio is a stunner and a great value. 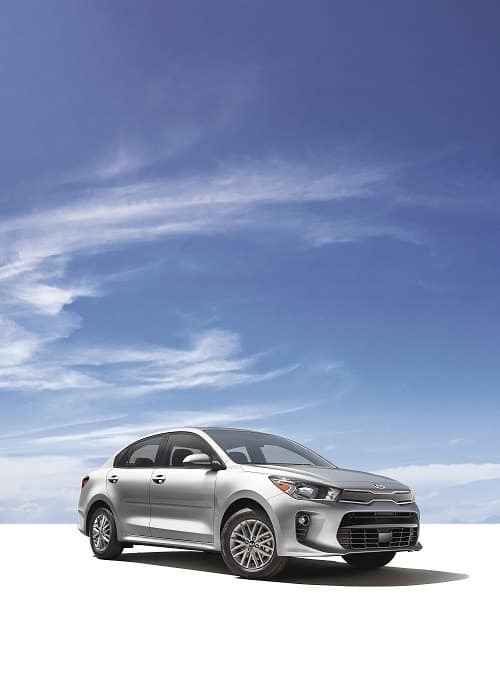 Now that you’ve browsed our available inventory of the 2018 Kia Rio here at Kendall, feel free to give us a call or contact us online if you have any questions. Our friendly and knowledgeable team of professionals will be here to assist you through your car buying process and beyond. We work with all types of credit and will help you find the right finance option for your budget. Visit our finance center today and apply for an auto loan. We also buy used vehicles, helping you get out of the old and into the new with a hassle-free and enjoyable experience. Bring us your current vehicle and receive a fair trade-in value in return. It really is that simple at Kendall Kia Nampa. Built with safety at the forefront, the Kia Rio comes with a bevy of standard safety features. Some standard safety features include four-wheel anti-lock brakes, stability control, tire pressure monitoring, hill-start assist, seat-mounted side airbags and side-curtain airbags, electric power steering, and a tilt and telescopic steering wheel. Premium safety features are also available and include steering-wheel-mounted cruise control, backup camera, and autonomous emergency braking. The Kia Rio is a great value and part of that value comes in the form of entertainment features. Standard with Bluetooth wireless data link for hands-free calling and audio streaming with a four-speaker or upgraded six-speaker audio system, satellite radio, and USB connection. You can upgrade to add Android Auto and Apple CarPlay, two innovative technology systems that interact with your smartphone via a UVO infotainment screen, which includes Geofencing, Speed Alert, Curfew Alert, Parking Minder, and much more. At Kendall Kia we’ll be here for you for the lifetime of your Rio. Come back to see us anytime for all your regular maintenance and repair needs. Simply schedule an appointment over the phone or online and our Kia service center will take excellent care of you and get you back on the road in no time. If you’re ever looking for parts and accessories, look no further than our Kia parts center. The 2018 Kia Rio is a svelte compact sedan with a luxury car feel. Drive away in yours today and optimize your life with nothing less than the very best from Kendall Kia Nampa.